When there is no pollution, BP condensates are similar in quality to distilled or demineralised water and also have a recoverable calorie potential. One particular feature of BP condensates is their total iron content generated to a large extent by metal particles being torn off through the effects of corrosion or throttling (vapour velocity). Depending on boiler constructor and water treatment specialist recommendations, BP condensate treatment can be considered. softening at 70-90°C using ion exchange resins. evaporation condensates from soaking water in starch plants or distilling slops in distilleries. These condensates contain high levels of organic matter (acetic acid, alcohols etc.) 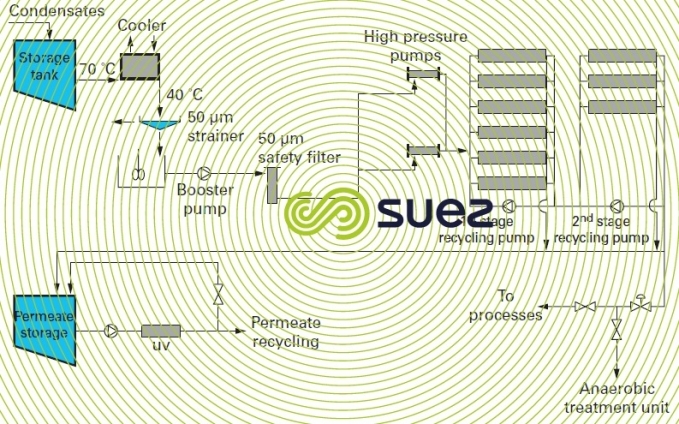 and can be recycled using reverse osmosis treatment as shown in figure 9 and photo 5. Corrosion in condensate and return lines that are usually constructed of carbon steel, is mainly caused by the medium’s acidity aggravated by the presence of traces of oxygen. The acid pH is linked to the carbon dioxide released in the vapour through the decomposition of the bicarbonates contained in water, and to hot carbonate hydrolysis. This drawback can be overcome by using neutralizing volatile amines such as: cyclohexyla­mine, morpholine, MEA, DEA (mono and diethanolamine), DEAE (dirthylaminoethanol), MOPA (methoxylpro­pylamine), DEHA (diethylhydroxylamine, which also reduces oxygen) or that form films such as octadecylamine. Film-forming amines isolate metal from water by creating a mono-molecular barrier. 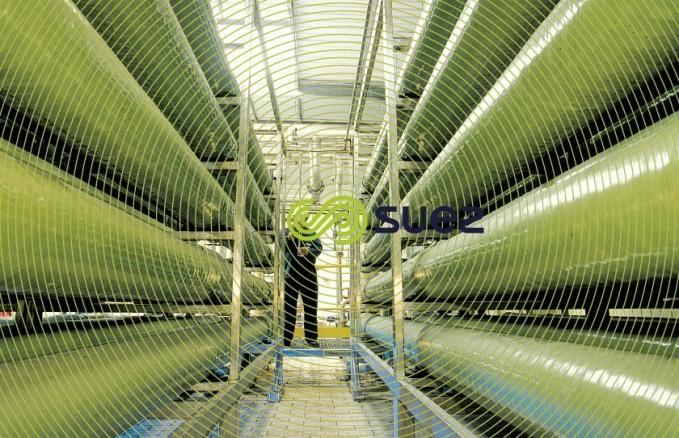 In most cases, it is advisable to use combinations of amines and reducing agents that have different vaporization and condensation coefficients, effectively protecting long and short thermal installation circuits from corrosion through the formation of a Fe3O4 protective coating. The following will be used in very specific cases: ammonia, ammonium phosphate that release ammonia into the boiler, polyphosphates and pyrophasphates injected direct into the vapour (using «white» vapour). Conditioning products are recovered and then recycled in the boiler house through condensate returns; these products also protect tanks and supply lines against corrosion. maintain pH at between 8.5 and 9.2. This pH range can be narrowed when copper alloys are present.